Can anyone find a Habitable Rogue planet? I have been searching for quite a long time for one, and have found no luck, have you? Unless you mean habitable with a space suit, it wouldn't be possible. Even if it was identical to Earth, you would have to adapt to living at 2* Kelvin. If you do mean habitable with the spacesuit, that's fairly easy. Fly to any rogue planet! No I mean one I mean like a desert planet, but I can't find any of those. Also with gravity close to 1g. Maybe an atmosphere of close to 1. With no sunlight, the entire atmosphere would be frozen, so any planemo that would have had an atmosphere would be an ice world. You all forget tidal heating. You can certainly find habitable worlds with no sun. 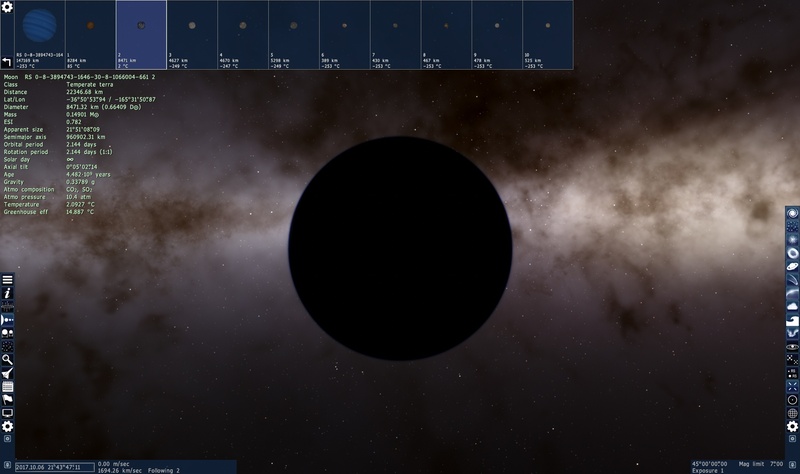 I'm not sure that tidal heating actually works the way it does in Space Engine. Io in real life has 1500° lava, but its surface temperature is still -170°. In reality, with an appropriate greenhouse atmosphere, tidal heating could very well yield habitable surface conditions on a rogue planet or moon. If you do some searching, you can find some journal articles about it. Is that one the most habitable one you have found so far? It's the only one I've found so far -- I'd never really thought to look for them before and this was my first quick and deliberate search. In the search settings, try putting the main star as "planemo", object as "planet and moon", set the planet to "gas giant" and moon to "terra" with perhaps 1000LY search radius. It should be possible to find a few results. Added: Here's another nice one. Raised the exposure and ambient light a little. How did you turn up the ambient? I found quite a few of them. Source of the post How did you turn up the ambient? I found quite a few of them. If you hover over the lower right corner of your screen (where the magnitude and exposure buttons are) and click the settings wheel. The ambient bar is the second from the bottom. Also "Shift"+"," and "Shift"+"." can also be used (at least I think that's the default). Could life evolve on a planemo? Also, why do planets in interstellar space have three names (orphan planet, rouge planet, planemo) that describe the same thing? 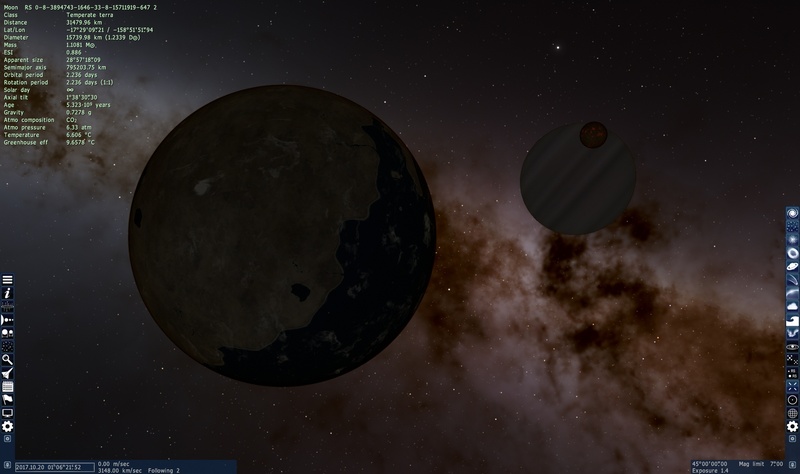 Source of the post In the search settings, try putting the main star as "planemo", object as "planet and moon", set the planet to "gas giant" and moon to "terra" with perhaps 1000LY search radius. It should be possible to find a few results. You should be able to find some with a 50 ly search radius. Its possible. As for your question I'd say different people call them different names. Even if one could exist on a planemo, I wouldn't call it living. Imagine perpetual night time, no beautiful sunlight, ever. I think it would drive many insane to live on a place like that. Source of the post Even if one could exist on a planemo, I wouldn't call it living. Imagine perpetual night time, no beautiful sunlight, ever. I think it would drive many insane to live on a place like that.